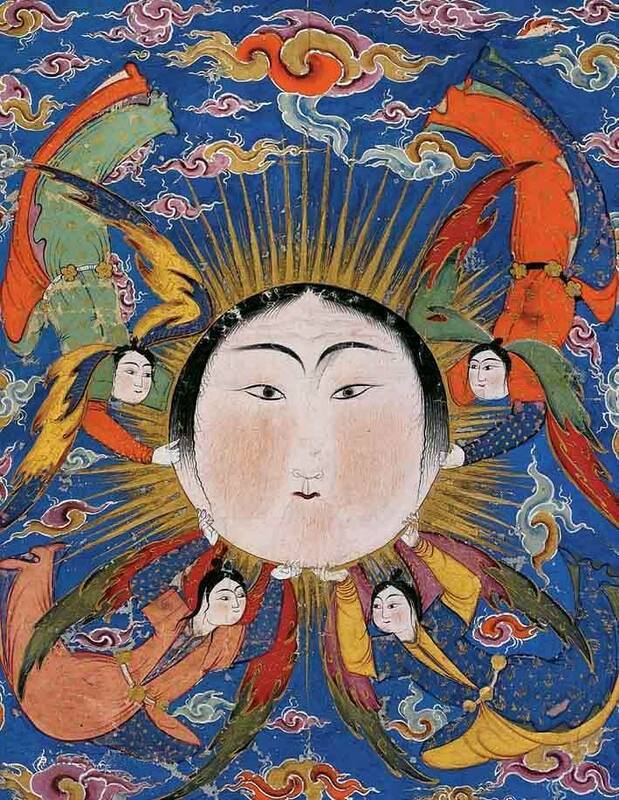 The Ingress of the Sun into zero degrees Aries marks the Spring Equinox and Nowruz. 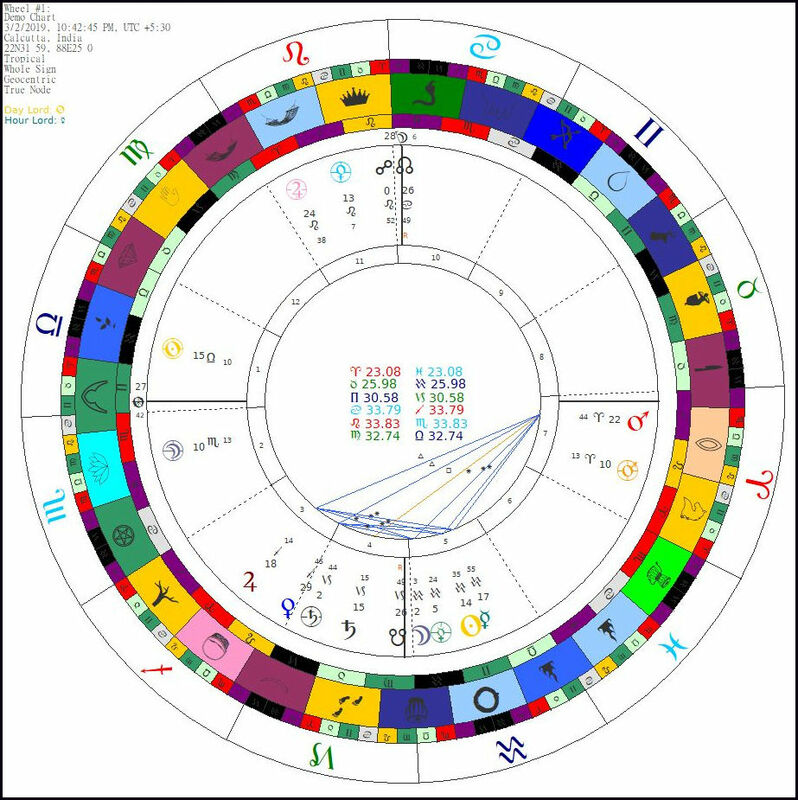 In some respects, this astrological event is the most important in the yearly cycle because it marks the astrological New Year and the chart provides us with insights into the entire year. Most importantly, we can derive the identity of the Lord or Lady of the Year – an influence which will be felt throughout. This year the Moon exalted in Taurus in the Ninth House is the Lady of the Year. The Sun is Exalted in Aries and we find Mars in his Exaltation with Saturn in his Domicile in the Fifth House. The planetary Day is Mars and the Planetary Hour belongs to Mercury. The Almuten of the charts is also Mars. Venus is in her Fall and Mercury is not strong in Aries. Both are Under the Beams – invisible due to the light of the Sun. The Hyleg according to Ptolemy is the Moon. 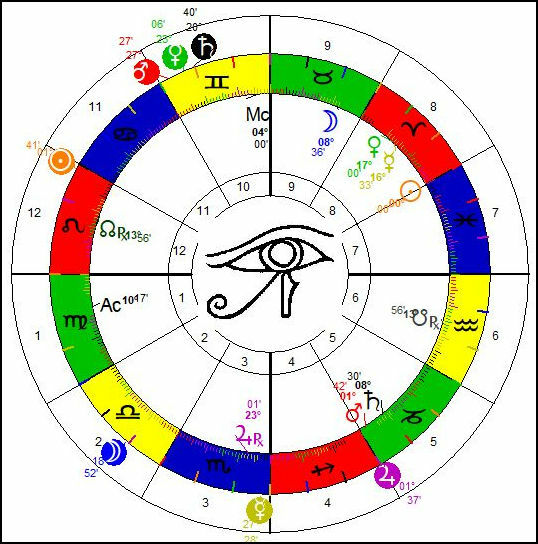 Much of this chart is a balancing act between the natures of Mars and Moon, but the Lady carries the day in the third Lunar Mansion. According to Cornelius Agrippa, this Mansion is called Aldebram or Aldelamen: eye or head of Taurus. 8°34’17” Taurus. destruction and hinderances of buildings, fountains, wells and gold mines, the flight of reptiles and creates discord revenge, separation, enmity & ill will A soldier on a horse, holding a serpent in his right hand. However, Ibn Arabi suggests the Mansion is Universal Substance, prima materia – the last Divine Attribute. For those of you who have an interest in the Mansions, I recommend studying the principal stars of each one. 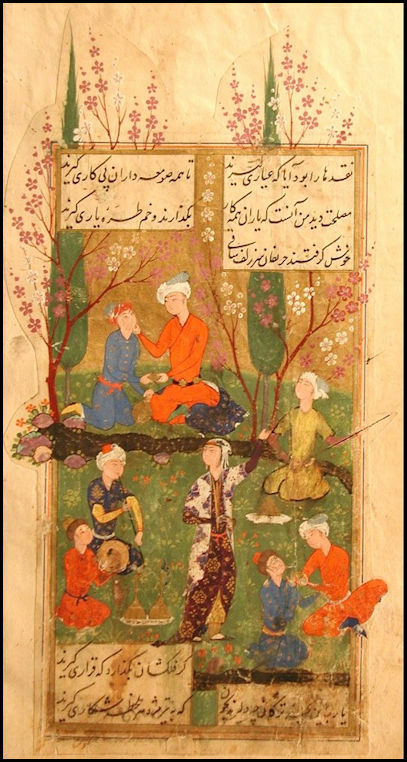 Illustration from the Divan of Hafez 1585 miniature. 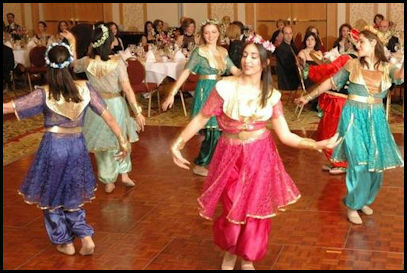 Iranians of all faiths – Muslims, Baha’is, and Zoroastrians turn to Hafiz on Nowruz, the Persian New Year, for guidance about the year to come. According to my friend in Afghanistan, the Divan is used as a kind of divination where the book is opened at a random page to read what it says. I don’t go into great detail on the charts for the four Equinox/Solstices unless it is part of a specific prediction for two reasons. First of all, the chart will be significantly different for various locations. The Equinox chart for Tehran, for example, has a Libra Ascendant and the Moon in the Eighth house. More importantly, I think, these events are primarily a time of celebration and reflection. 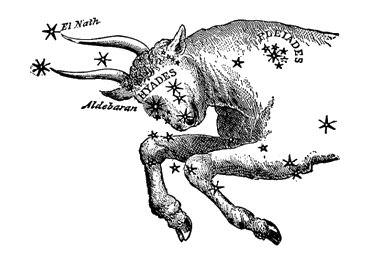 The Aries Ingress is the New Year and in Iran and other countries with a Persian diaspora, it is a time of cleansing and renewal in other spiritual and religious traditions also. The seasons resonate with us all. 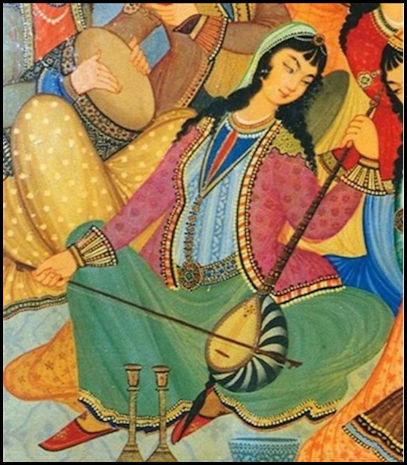 Persian woman playing the traditional Kamancheh at Nowruz celebration. For Nowruz, each household will display symbolic items on a table, called a haft seen. 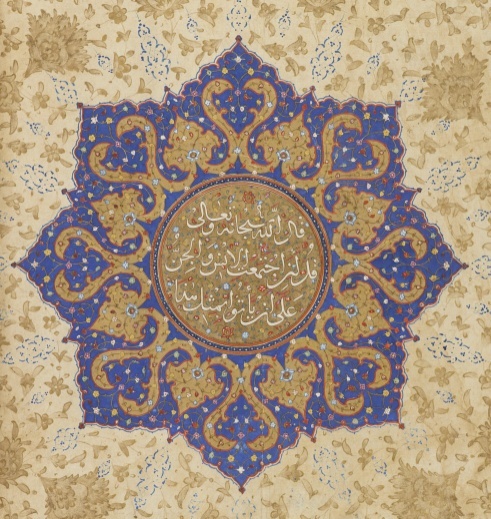 On the haft seen, there is a minimum of seven items, the names of which begin with the Iranian letter that looks like an “s.” Each and every item carries a meaning – coins are for wealth, hyacinth flowers for rebirth, apples for health and beauty and germinated wheat or barley seeds for fertility. 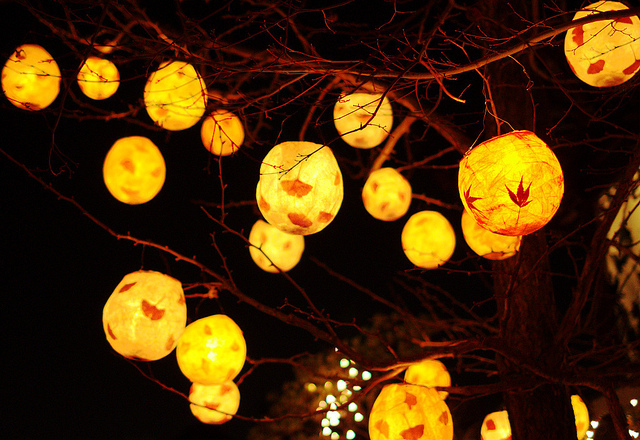 It’s a celebration of renewed life and the waxing light force. Comparable celebrations occur around the world, including Easter. The latter is timed using the Lunar Calendar, which is why it’s a moveable feast. The theme remains new life, resurrection, and fertility. Astrology is a mystical art. 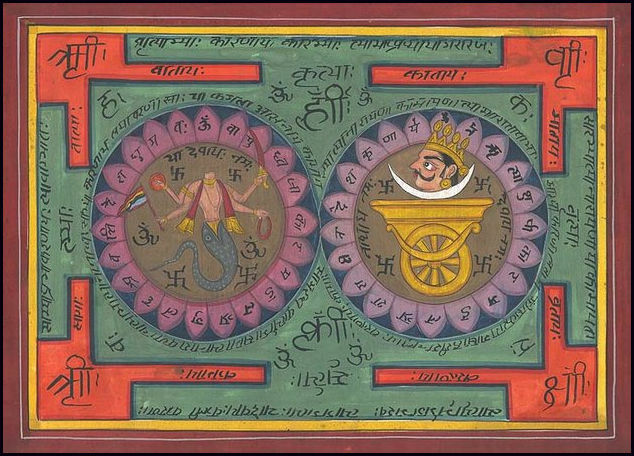 As far as Occidental, Arabian, Persian and to a large extent Indian astrology is concerned, its basis is the Syncretic Neo-Platonic and Hermetic Philosophy as it flourished in Alexandria. Of course, these different but compatible philosophies had far more ancient roots. 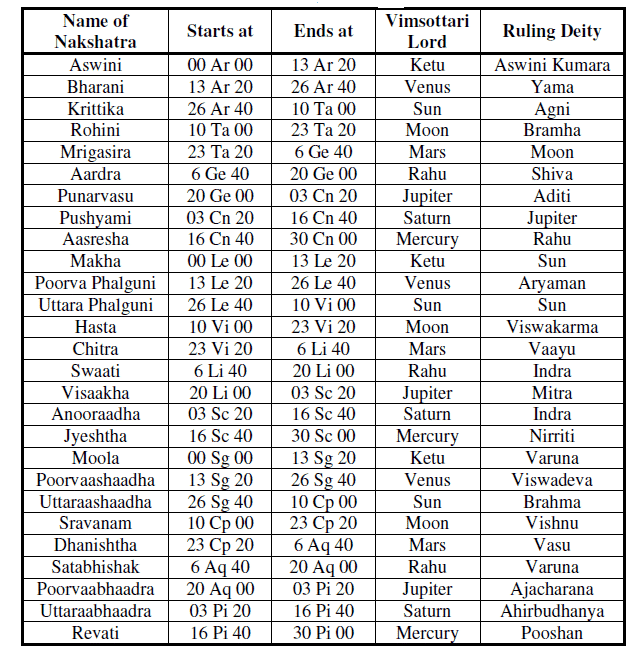 It is also true that astrology differed in its expression, depending on the culture in which it was practised. But the differences are for the most part quite superficial. At the core of all these strains is the Hermetic dictum: As above, So below. This isn’t just a saying or something that is true some of the time. It is Divine Spark and a Living truth. This is but a brief introduction to the underlying spiritual principles, from the point of view of a Sufi master. I wonder if anyone understood this better than Ibn Arabi. You won’t just find his Mystical Astrology in the books he wrote on the subject. His worldview was saturated in and consumed by the expression of mysticism – a cosmos where all was inextricably connected. I recommend his book Divine Governance of the Human Kingdom for deeper insight. Ibn ʿArabī was an Arab Andalusian Sufi mystic and philosopher, nicknamed “Son of Plato.” He is also one of the best know Astrologers of the Islamic Golden Age. Born: July 28, 1165, Murcia – Died: November 10, 1240 in Damascus. One of his greatest gifts is what I will call meta – astrology, and articulation of the manifestation of the divine through astrology. At about the age of fifteen. he had an extraordinary mystical unveiling or “opening.” This is mentioned in his famous account of his meeting with Averroes. The experience changed him and only after this original divine “attraction did he begin his Sufi practices. Ibn ‘Arabi also studied the traditional sciences, as did virtually all astrologers. degrees to either side of the sphere of the sun, the Divine (Throne) symbolizing the synthesis of all the cosmos, and the centre of the earth being thereof both the inferior conclusion and the center of fixation (Burkhardt p. 12). Ibn Arabi’s mysticism is in most respects universal, but with regard to the Moon, for example, his beliefs coincided with Islamic esotericism. 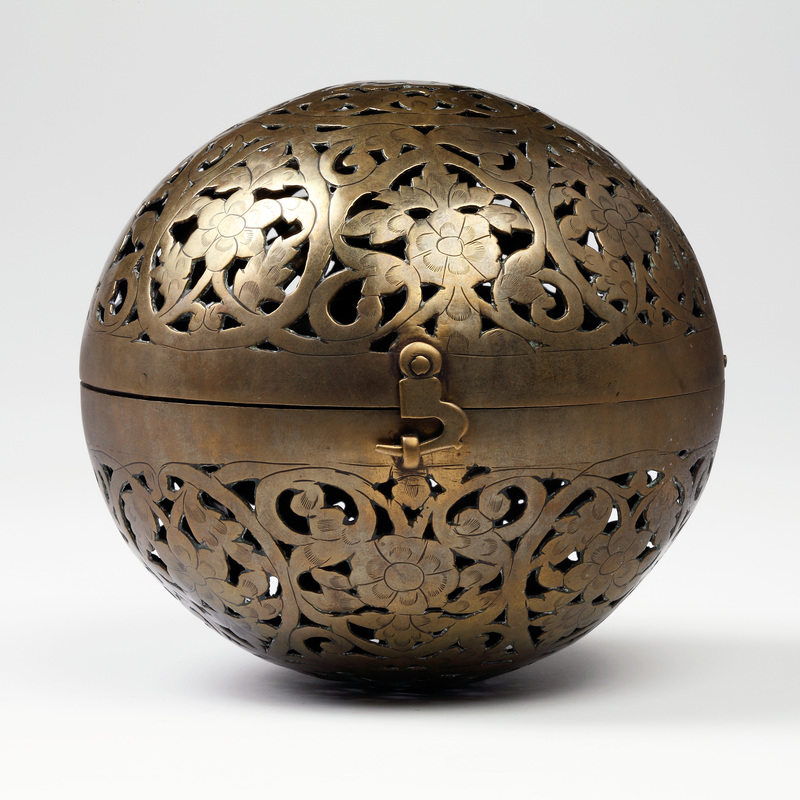 The Moon plays a particular visual role in Islamic culture. Most Islamic countries have the Moon as part of their flag, Islam itself, however, is under the governance of Venus as all Arab and Persian astrologers have made clear. I would like to focus on this Lunar material because of course it directly relates to the Lunar Mansions. For Ibn Arabi, the Moon receives all influences which she then collects to transmit to Earth. Adam is considered Lunar Man and Enoch as Solar Man – The first is the Primordial and individual man and the latter the Divine Man. The full extent of this system requires considerable study and certainly more than I am able to do here. Still, these simple but profound things are important to keep in mind. Ibn Arabi compares the “‘unique man ‘, which receives the revelation (tajaili) of the Divine Essence (dhat); this heart changes form continually according to the different ‘essential truths’ (haqc1 iq) which leave successively therein their imprint” (Burkhardt 34).He has a masterful understanding of the archetypes and employs them in a mystical astrologer that is also accurate. We are after all referring to Divine Essence. 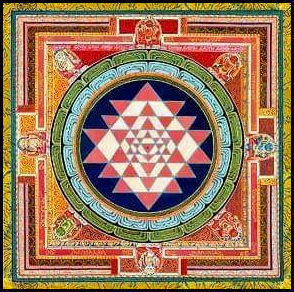 The qualities of the Divine Names are of necessity innumerable because this Essence cannot be the “subject” of a science because that would imply distinction, in a similar sense as the infinite cannot be grasped by a finite mind. ” the Master makes the 28 mansions of the Moon correspond to as many Divine Names. On the other hand, these, which all have an active or creative character, have as complements or as direct objects the same number of cosmic degrees, so that their connection forms a second analogous cycle. 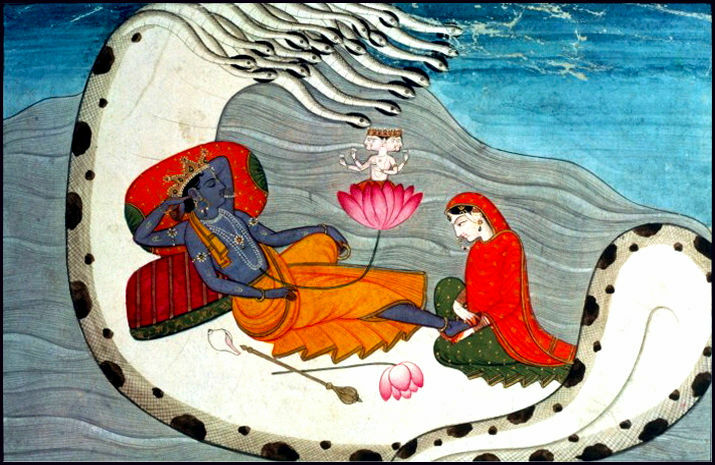 The series of these cosmic degrees produced by the series of the Divine Names go from the first manifestation of the In­tellect down to the creation of man. ” (Burkhardt 37.) Ibn Arabi ‘s is a living breathing and divine creation. Returning to the Moon, Ibn Arabi explains that it is this Lunar mediation that relates to what he calls the “transformation of the Primordial Sound” that is the vehicle of spiritual revelation, in articulated language. Islamic mysticism creates a correspondence between the 28 Mansions of the Moon and Twenty Eight letters or sounds of the sacred language. There will be two consecutive Full Moons in Scorpio in 2008. The last one occurred 20 April 2008 @ 2:33 am pst. This is not to be confused with the Blue Moon phenomenon, which is a fourth Full Moon in a given season. That occurs approximately every 2.7 years to reflect the fact that the Solar Year is longer than twelve Lunar Cycles, but less than thirteen. It is commonly misunderstood that a Blue Moon is the second Full Moon in a given calendar month. Nevertheless, to have two consecutive Full Moons in any one sign is a rare enough event. I am giving this pair a little extra attention because the configuration is of great interest for a number of reasons. The April chart had Saturn as the ruler of the Ascendant retrograde in the seventh house with the Dragon’s Tail. The Eight / Two axis is known as the Gates of Hades or Domain of Typhon. Note that in the May chart the Sun and Moon change places on the same axis. The Moon is parallel Sirius and conjunct the Arabic Part of Understanding. The parallel aspect is much stronger than the conjunction. The Moon is in her fall and the powerful influence of Sirius brings passionate, searing intensity to an already volatile mix. The Moon in the traditional decanate of Mars, accentuates her already Martian nature. She is disposited by Mars in Cancer, the sign of his fall. This provides what is called a negative mutual reception. Both are in the sign of their own fall. A weak malefic is a damaging one. According to Ptolemy, Sirius, the brightest of all stars is of the nature of Jupiter and Mars. With the Moon, there is general good fortune, if free of malefics. This is a case of a highly baneful situation being ameliorated by association with a particular star and Arabic Part. However, this relief is slight considering the overall picture. Regrettably, the planets have delivered their promise by way of global catastrophes in the same elements. Much suffering could have been avoided if the celestial forcasts had been heeded. In itself, we can then see that the chart is certainly challenging enough, but its full import is seen with the second opposition in the same sign a month later. The second consecutive Full Moon in Scorpio occurs 19 May 2008 @ 4.44 pm pdt, just before the Sun enters Gemini. Note that Saturn has gone direct and sits on the same degree as the Full Lunar Eclipse of 20 February 2008 @ 7:26 pm. pst. It is also in almost precisely the same position as it was in the April chart. The May chart has Venus combust in the eighth house and, although dignified by sign, cannot do much due to both combustion and house placement. 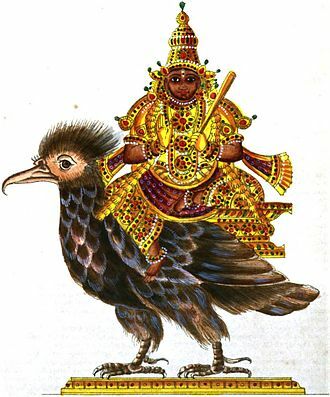 Venus is ruler of the Ascendant and caught up with the Sun’s opposition to the Moon on the same axis. Morover, the Dragon’s Tail is besieged by Saturn and Mars. Both Saturn and the South Node are in the twelfth Lunar Mansion, Al Safah, the Changer of the Weather. Mars disposits the Part of Fortune, found in the unfortunate sixth house in the Mansion of the Belly. By any standards, this is a nasty piece of work. With the current vulnerability to seismic activity, particularly around the Pacific rim, Central Asia and all countries where the Lunar Eclipse was visible, vigilence and preparation should be a matter of course. Any country under the governenance of Virgo should also beware. Extreme siesmic activity is often the case with Sun, Jupiter and Saturn in Earth signs; and here we have exacerbating circumstances. This places Myanmar (formerly Burma) and China under the governance of the Earth triplicity at a time when Saturn, Sun and Jupiter occupies these signs. What he calls Ariana is what is now known as Afghanistan and Pakistan as far east as the Indus. In the chart for 19 May 2008, the Sun is conjunct the Fixed Star Alcyone, the brightest of the Pleiades, situated on the shoulder of the Bull. It is of the nature of Mars and the Moon. Negatively the star is associated with blindness caused by fevers, either literally of figuratively. The spread of disease as a result of the catastrophes in Myanmar and China is a very real, but preventable threat; but first, blindness must give way to vision. This is most particularly the case in Myanmar. The Lunar degree of this chart falls in the nineteenth Mansion known Al Shaulah, The Sting. The Ascending degree is in the sixteenth Mansion Al Jubana, The Claws, and in Via Combusta. The latter is a region of the zodiac that contains many baneful stars, with the notable exception of Spica. However, the Moon in the 28 th degree of Scorpio has Venus for decanate ruler, rather than Mars as was the case in the April chart. This Solar degree falls in the Lunar Mansion Al Thurayya (the many little ones) and is said to be profitable to sailors and alchemists. Taken figuratively, this augers well for the afflicted and an albeit belated rescue effort for Burma, particularly as the Sun moves into Gemini and the Moon enters Sagittarius, forming a fleeting but perfect trine to Mars at the time of the Solar Ingress. She will be in parallel with Antares, the Heart of the Scorpion, before the opposition fully separates. Venus will soon be out from under the Sun’s beams. This is a brief period of respite, before Mars closes in on the Dragon’s Tail. Excessive heat and fires fanned by high winds are predicted when the Moon co-joins with them. Please bear in mind that the house placements will differ from one time zone to another. These comments are most specifically relevant to the Pacific Coast in that regard only. The comments on fixed star placement and planetary aspects otherwise remain the same and are most immediately concerned with the areas Ptolemy identified with the Earth Triplicity. Al-Biruni mentioned a foundation chart for Baghdad, calculated by the court astrologer, Nawbakht with the assistance of the great Mashallah. This occurred under the caliph Abu Ja’far Al-Mansur who believed Baghdad would be the ideal capital of the Islamic empire under the Abbasids. They were appointed to select a favourable time to begin construction of the capital. It was a truly massive project that would ultimately hire 100,000 labourers. The first question likely to arise in the modern metaphysical mind, is ‘were they completely mad?’ The first element most likely to strike fear and loathing into the sensitive New Age soul is the Grand Cross, that most hated and damning of all aspect patterns. There is a chart showing the aspects and modern planets here. Saturn is in the fifth house, squaring Mercury and the Nodes. Worst of all, he opposes the Moon. As if they couldn’t botch things any worse, Jupiter opposes Mars. This is a fair presentation of how a modern astrologer would view this chart. From a traditional point of view the chart is an entirely different entity and a stroke of electional genius. Let’s forget about geometry for one minute and think instead of essential nature. An aspect such as an opposition has meaning only insofar as natures oppose each other. In this case, the Moon is in the late degrees of Libra and Saturn in the early degrees of Taurus. The opposition of nature would occur if the Moon were in Scorpio. Planets and luminaries, not aspects, have orbs. The Nodes emit no light and therefore have no orbs, for that is the basis of orbs in the first place. They are orbs of light. Although a modern aspectarian would view Saturn as squared the Nodes, by nature they are in fact trine and of the same element. In fact, we can see that the astrologers were working within a relatively small window to find the closest thing to a perfect time. The perfect election exists only in the mind of God. A good election is comprised of the best possible moment, accentuating the beneficial and minimizing the malefic towards a desired end. It is surely no coincidence that the Moon has entered the 12th Lunar Mansion, Al Simak. The meaning of this Mansion is “The Unarmed. 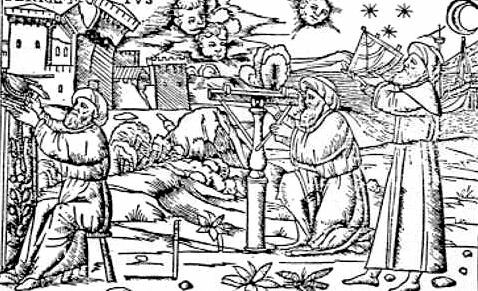 Causes marital love, cures the sick … With Moon here, dig but do not marry or travel.” The astrologers might have prefered it were at the entrance degree of 22 Libra 43; but that would have left Mars above the horizon and the election would have been spoiled. What we said about the Moon and Saturn, we can say about Mercury and Saturn. We find Mercury in the late degrees of Cancer which, like Libra is Cardinal. Fixed does not square or oppose Cardinal. It is a question of essential nature. So, the “Grand Cross” is in fact a geometric illusion and nothing more. Being in orb is not the point. Essential nature is. Now, let’s look at the Mars / Jupiter opposition. The sixth house is considered an unfortunate house, along with the eighth and twelfth. One reason given for this is that it cannot ’see’ the Ascendant. Mars has just set. It is also the perfect place to put Mars because in the sixth House he is like a tiger in a cage. He is said to be in his Joy in this house. The astrologers probably thought that Mars was rendered far less harmful because of his house placement and the fact that he’s in sect. At any rate, this is the chart the astrologers selected and must have felt that Mars was sufficiently subdued. The only other explanations that occur to me at this time is that their intentions were malicious or they were incompetent beyond imagination, neither of which are at all convincing. This great new centre of learning has Jupiter in his own sign as the life blood of this new city, as the Ascendant is the health of the native. The Sun in the eighth place, by the rule of 5 is in the ninth house. 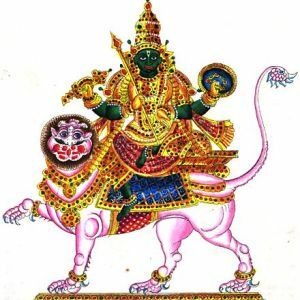 This is the House of God and the Sun finds his Joy here in the royal sign of Leo. Here we find the Lord of the Geniture. The Arabic Part of Faith is found in the same house. The Part of Spirit is in partile conjunction with the Midheaven. A protective Venus, disposited by the eleventh house Moon in Venusian Libra is placed in the house of partners and enemies. The enemies of Baghdad are rendered benign, as they have been for the majority of the city’s history. The eleventh house supports the tenth, which is in turn informed by the ninth. Baghdad was the greatest centre of learning and culture when Europe was a comparatively primitive backwater. In this cursory reading of this election, it is evident that these astrologers were truly masters of the art. This also serves as a striking example of how a modern and traditional astrologer would view this election in the first place. 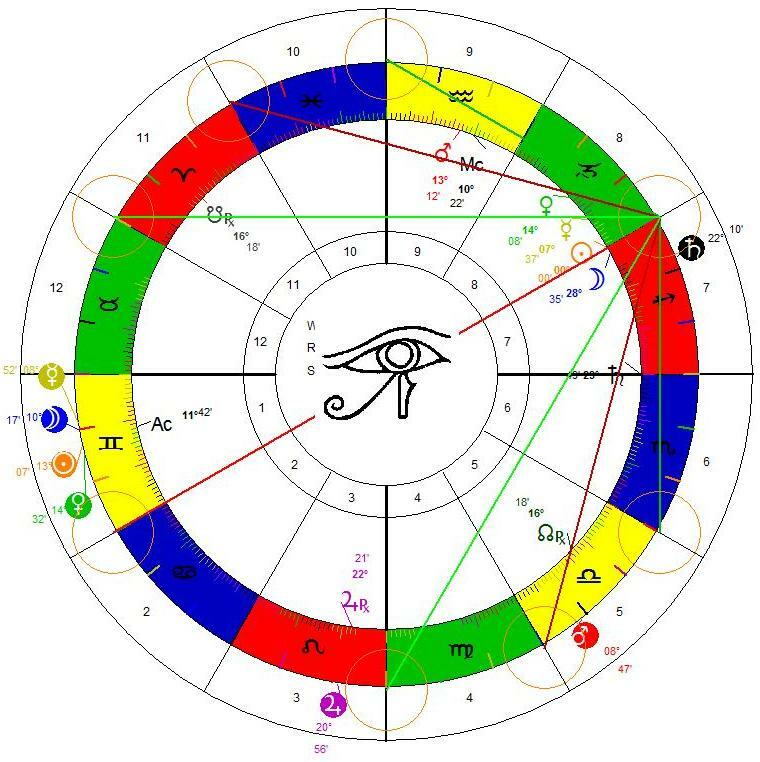 The timing is ingenious from a classical point of view; yet the same chart seems mere folly when viewed through the lense of post enlightenment astrological theory. In response to several thoughtful comments and queries (and two really obnoxious ones) regarding this article, I’ve added two other versions of the same chart. The first is Whole Sign. The second is Whole Sign using the Sidereal zodiac. The latter was mentioned by Mark and I think it deserves some close study. I’ve set the charts up as thumbnails so you can comment on them individually if you prefer.